There is nothing in all the world like a mother and her newborn child. They are a holy couple, bound together by the miracle they have performed, held in the embrace of angels. Yet, the earthly forces are strong and insistent. There is blood, urine, and meconium, soiled sheets and swelling breasts, perhaps stitches to heal or recovery from the trauma of a cesarean-section. The baby must learn to nurse, to digest, to eliminate, to communicate. The mother is wide-open and very sensitive. The father is struggling to adapt to his new role and to recognize the woman he loves in this miracle-worker who switches from protective lioness to sobbing girl in a matter of moments. They need support on many levels: physical, emotional, intellectual, spiritual. In simpler times, the needs of the birthing family were met naturally by the community. Neighbor women could be called upon day or night to attend a laboring mother. Nearby families cared for her older children and delivered food to nourish her in her recovery. Friends came by to do the household chores. And she was most definitely supported and encouraged and expected to succeed in breastfeeding her infant. Times have changed. Our mothers, sisters, and friends are often not available to help us in our time of need. But the need remains. The role of the professional doula is to provide competent and caring postpartum support; to fill in the gaps not filled by family or friends. What can you do as a friend of a new mother? Offer to organize other friends to drop off dinners for the first few weeks, being clear about the postpartum family’s food preferences. Be a conscientious visitor, don’t stay too long, tire the new mom out, or bring rambunctious small children. Bring lunch or offer to fix a snack. Are there any errands she needs done? While you chat, fold that basket of laundry, empty the trash, or wash up the dirty dishes. Rub her feet, hug her, listen, and understand. 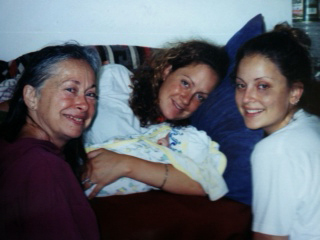 When I was 16, my best friend, also 16, gave birth to a lovely daughter. I came to the hospital with yellow roses, her favorite. She confided that everyone else had brought pink flowers and gifts for the baby; I was the only one whose gift was for her. I never forgot her gratitude. In my work as a doula, my focus is on the mother. I want to help her to feel comfortable, nourished, relaxed and appreciated; to facilitate a harmonious transition for both mother and child in those most profound first days and weeks after birth. A mother needs someone who cares about how many times the baby woke to nurse in the night, how many diapers were changed, how her breasts are feeling. She may want her back massaged or her sheets changed. She may need someone to provide an abundant supply of water or tea, salads ready-made in the refrigerator, a bowl of cut-up fruit or some scrambled eggs. She needs to be able to complain about how little her mate understands what she’s going through, and perhaps some gentle reminders of all the contributions he has made. She needs someone to hold the baby so she can take a shower; someone to answer the phone when she’s napping; someone to water her plants or garden; to clean the kitchen and bathroom; to keep up on the family’s laundry. She may have many questions and concerns that only an experienced mother can understand. She needs patience and kind words, and a clean and calm environment. I take my cues from the mothers. If there are small children in the family, I may spend my time nurturing, listening to, and playing with them. 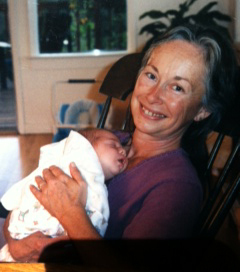 This may be the mother’s greatest need- to have her older children lovingly cared for while she is resting and healing. In some families, I see little of the mother and babe. Instead, my focus is on filling the needs of her family so that she can have the peace of mind to rest and luxuriate in the awe and wonder of her newest child. For many women, the personal, feminine, emotional support is as necessary as the hot soup and clean kitchen. Postpartum is a time of incredible spiritual and physical highs and lows, unequaled in the lives of most of us. Sleep deprivation can wreak havoc on one’s attitude and point of view. A loving, womanly friend can be a lifeline. Postpartum dads need doulas, too. Many have no one they can really talk to about what they are going through at this time. They are open to suggestions and respond well to compassion and understanding. Their lives have gone topsy-turvy. In the outside world, they are expected to behave as usual, be on time, and be competent, while at home, their sleep is interrupted, their wives are distracted, and this incredible tiny person fills them with awe and insecurity and other indescribable emotions. Just the physical act of holding a newborn can be overwhelming if you’ve never done it before. Feeling incompetent is not a comfortable space for anyone, especially not for a new father whose infant screams in his arms, only to find immediate comfort in those of its mother. The possibility of Dad feeling left out, pushed out, or unnecessary certainly exists. Often a kind word spoken in behalf of the father can stimulate the mother to recognize his struggle and to consciously enclose him in her circle of love that she’s sharing with baby. I think fondly of a couple whose first child was born by emergency c-section. After several days in the hospital, the husband called me to say they were coming home and they needed me by 9:00 a.m. on Monday. He simply had to get back to work early after taking time off due to the complications of the birth. I arrived to find him in bed with the covers pulled over his head, feeling dizzy and overwhelmed, not ready to adjust to the “real world” after the life and death drama he’d been a part of and the sobering reality of bringing the baby home. I served the new parents breakfast in bed, followed by some tidying up and heart-to-heart talking and encouragement. New parents are tremendously relieved by the presence of someone who is calm and confident, and who handles their infant lovingly. Modeling a relaxed and responsive style of baby care is an important function of the doula. Incredible as it seems, our culture, with its emphasis on education, has left many young adults entirely unprepared to face the practical realities of parenting. And this may be the most important job they will ever hold. So, for those of us who are comfortable and happy in the work of parenting, we can serve the future of humanity through humbly sharing our skills and our love for children and families.